An online petition has already attracted more than 45,000 signatures in 10 days and they hope to reach a million supporters by March 15. The slogan on posters in Paris streets translates as "Yes We Can!" 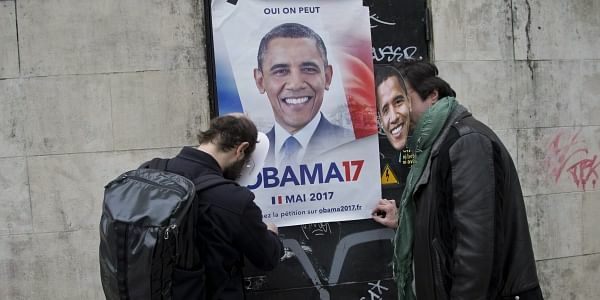 The people behind the campaign are urging former U.S President Barack Obama to join the French presidential race. Their online petition has already attracted more than 45,000 signatures in 10 days and they hope to reach a million supporters by March 15. With the buildup to the April-May presidential election so far dominated by the corruption investigation targeting conservative Francois Fillon, organizers say they want to inject a dose of humor in the campaign. The whole thing started as a big joke between friends, one of the organizers told The Associated Press. He identified himself only as "Antoine," declining to give his real name because the posters have been put up illegally and he feared a fine. Antoine, who spoke to the AP in Paris with his face covered by a cut-out mask of Obama, said that he and his friends decided on the campaign over a drink, after realizing they didn't know for whom they would vote. Antoine said he invested 1,500 euros ($1,592) in the campaign, printing out 500 posters. The team has also had mugs and T-shirts made with the image of Obama, which they are selling on their website. They say the profits will go to a scholarship fund for students from poor neighborhoods attending classes at Sciences Politiques, one of France's most prestigious universities. Though widely popular in France, Obama has no chance of success. He is not French and has no right to take part in the race. Sarah Wachter, an American who has lived in France since 1999, sees the petition as a positive sign for France. "People want change but they want the right kind of change. Change that is inclusive, change that is human but change that is also open to the world and that is a very delicate balance to strike," she told AP. "But I think that Obama has done that in the United States."